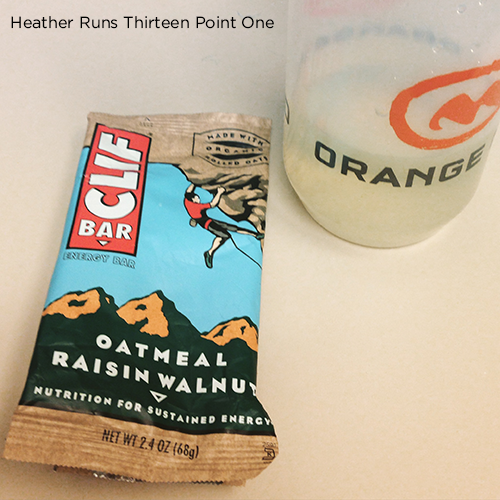 Heather Runs Thirteen Point One: mestrength review: what's in your water? Disclaimer: I received MESTRENGTH to review as part of being a BibRave Pro. Learn more about becoming a BibRave Pro (ambassador), and check out BibRave.com to review, find, and write race reviews! I'm a big fan of testing out different products to see what works best for me. Just because I found something I love/works, doesn't mean I won't try a different brand to see if it works even better. You just never know what you might find. As always, I was very excited when I heard I would be receiving a hydration product in the mail via the BibRave Pro program - MESTRENGTH would be sending me a sample of their 5 flavors... and not just one of each, but two. Joy! We actually had our choice of flavors, but I wanted to try the whole lot, so went with the mixed sampler. 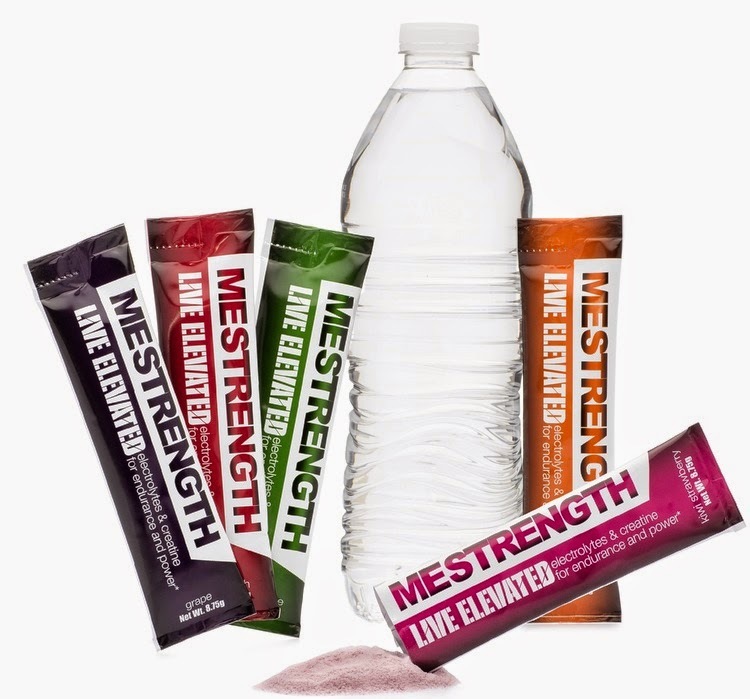 What's nice about MESTRENGTH is that it's packaged in single serving stick-packs that are easy to carry and mix with 20 ounces of water. I found I liked to toss it in a water bottle and then shake it up to mix it. I even threw a pack in my purse for when I was on the go, but wanted to rehydrate with something other than plain water (if you know me, you know I have trouble drinking enough water because I don't love the taste... I wish I was the kind of gal that drank 100 oz a day no problem, but I'm just not... I like flavor, dang it!). I gave each flavor a try and have to say that Lemon-Lime was the winner for me. I enjoyed the other flavors, but I feel this one was a bit less tart than the others. I found the Strawberry-Kiwi, Fruit Punch, and Grape to be very tart, while Orange and Lemon-Lime were a little less so. Not to say I minded the tartness much, I just preferred the flavors that had a little less – obviously that is all about personal preference. I didn't notice any weird after taste, and there wasn't any strange texture to it, which is always a plus. Also, I generally am not a fan of anything that uses Stevia, I often get headaches or just don't like the taste, but I honestly didn't have any issues with it, and didn't even know it was in there until I took a glance at the ingredient list — after I already drank one... is that horrible?! My first instinct, generally, isn't to look at that, though I know I should. But hear me out – I have no expectations going in if I don't read the ingredient list... I might have gotten a phantom headache because I knew stevia was in there, but not knowing meant that the taste test was unharmed by any preconceived notions. Boom. Anyway, here's the ingredient list (per serving): Calcium (30mg), Phosphorus (15mg), Magnesium (15mg), potassium (30mg), Creatine Monohydrate (5g), Citric Acid, Natural Flavor, Vegetable and Fruit Juice (for color), and Stevia (a calorie free plant based sweetener). a ClIF BAR was my lunch. I did notice that after some longer runs, muscle recovery seemed to be better than normal. However I didn't notice much difference from the shorter runs – this is probably because my muscles aren't working as hard/long, so generally I don't feel sore post maintenance runs. I really wish I had received this product prior to completing my first marathon – I feel that it would have been a better time to test the product out, as I think I would have been able to notice the recovery aspect better (my long runs these days aren't nearly as long as they were training for the Dopey Challenge, nor as frequent). If I get in to the Chicago Marathon, I'll continue to test out MESTRENGTH to see how it helps with the long long runs. As I become a more seasoned runner, I'm learning the importance of recovery. When I was first starting half marathons, I knew nothing. While my recovery wasn't horrible, it's not nearly as easy as it is now (and when I say easy, I just mean I treat my body with more respect post-run... recovery can still mean some aches and pains... like in my shins). I love my compression sleeves, chocolate milk, and know that hydration is a key factor in smart recovery. I've found that I love Nuun (especially during my runs or just to spruce up my water during the day), Hoist after a long run (or after a night of drinking one too many), and am now also a big fan of MESTRENGTH. 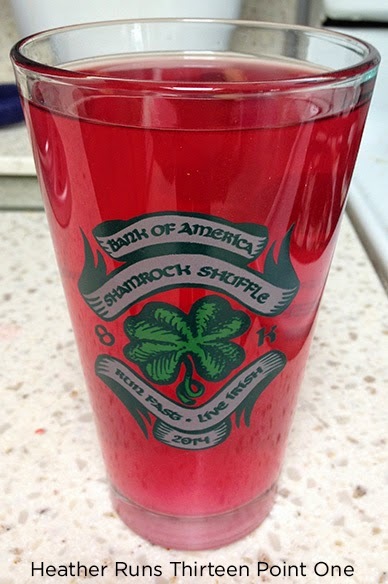 Fruit Punch in my Shamrock Shuffle 8k pint glass post-run. • Just enough creatine to support lean muscles (muscles need creatine, your body produces it, and it's one of the most widely studied nutritional supplements on the market. By Adding just 5 grams creatine, MESTRENGTH helps you to maximize each workout and minimize muscle soreness, without producing the muscle 'bulk' typically associated with creatine). 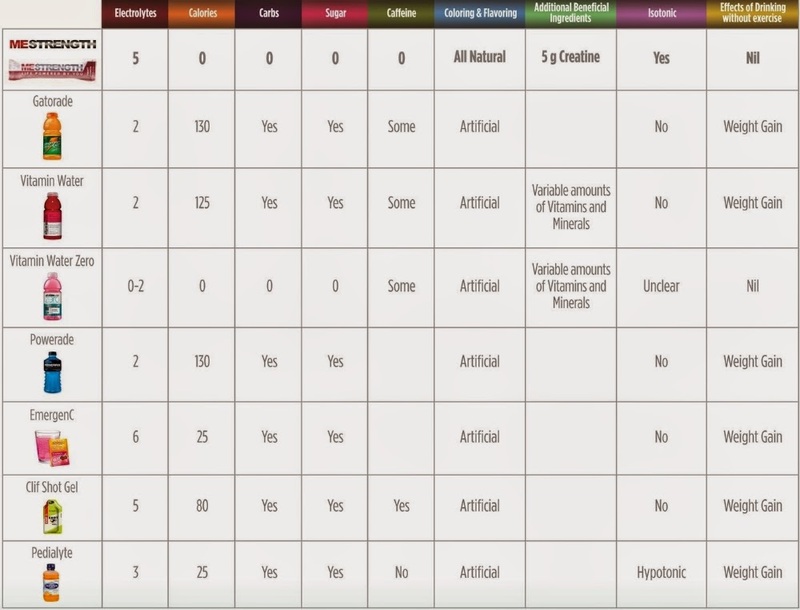 Chart comparing MESTRENGTH to other sport drinks. The non-supplement portion is all-natural. The 'non-supplement portion' = although creatine is naturally produced by the human body, creatine-monohydrate is still considered synthetic. All of the other ingredients are all-nautral and no artificial sweeteners or artificial food coloring is used. Have you ever tried MESTRENGTH If not, here's a great reason to give it a try – 25% off until February 28. Head on over to Amazon and enter code 'BIBRVE25' at checkout. You have options of 10, 20, or 30 sticks, plus all one flavor or go for the mixed pack if you want to try them all. Have Amazon Prime? That means free 2-day shipping! It's a great way to enhance your water (something I love to do, since plain water just doesn't do it for me). No need to mix up your routine... drink it whenever you drank water or other sports drink and try swapping that out for MESTRENGTH. Have questions about MESTRENGTH? Check out their FAQ here. Or if it's something short, ask away on Twitter. 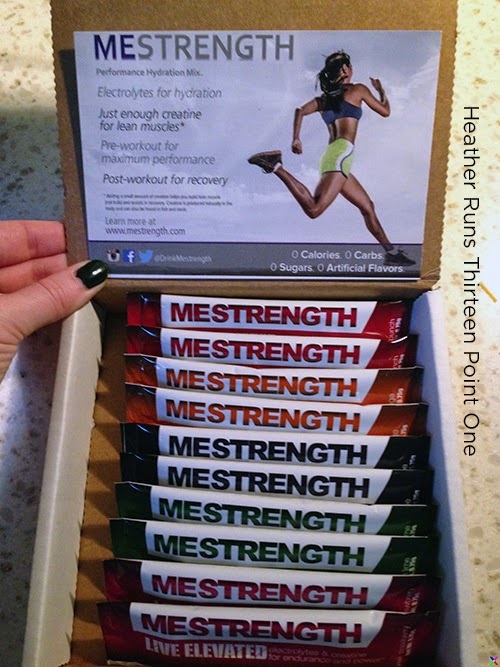 There are a few shops in Chicago that sell it, but other than that - online only as of now (MESTRENGTH website, Amazon, Clever Training (http://www.clevertraining.com/mestrength-hydration-drink-mix-with-mixed-flavor-s-30-sticks.html), or Bulubox (http://www.bulubox.com/shop/mestrength.html).